Cameo glass came about as Romans experimented with newly discovered glass blowing techniques. A base piece of glass was coated with one to several additional glass layers in varying colors resulting in an object that could be carved decoratively to create a scene. As the glass was cut, color was revealed by removing the top layers. The end product was a decorative vessel or object with low relief carving. Carving glass in this manner continued through the ensuing centuries. Most of the cameo glass collectors find today was made from the late 1800s through the early 1900s. A number of different companies were known to create this type of ware throughout Europe with some of the most prominent examples coming from France and England. This unusual cameo art glass vase depicts an octopus in an ocean scene. The octopus is carved in relief, the vase is colored in green and deep red, and it is unmarked so the maker is unknown. It is in excellent condition standing 6" tall. Sold for $7,800 (not including buyer’s premium) at Morphy Auctions in August, 2013 exhibiting the high value of cameo glass pieces even when the maker is not verified. Continue to slide two to see an example of Galle’ cameo glass made in France. 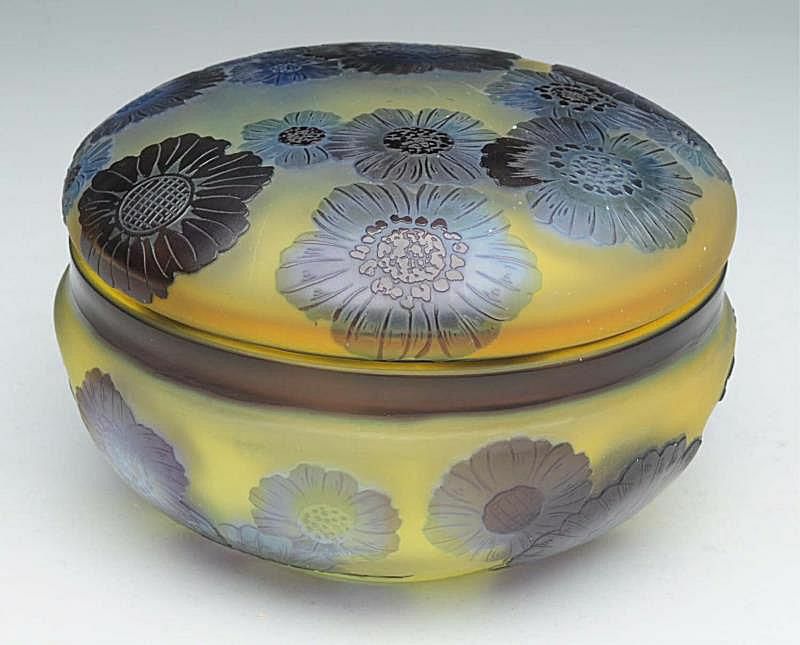 After experimenting with clear glass decorated in more traditionally, in the late 1800s Emile Gallé began using colored opaque glass for his pieces. These colors were often layered and etched or carved to create unique cameo art glass designs. This Gallé cameo art glass lidded jar measures 4” tall. In spite of a rim chip that is not visible when the lid is on, it still sold for $2,040 (not including buyer’s premium) at Morphy Auctions in August, 2014. Even a damaged piece of cameo glass can still be valuable if it is by a notable glass maker. Continue to slide three to see an example of Daum Nancy cameo glass made in France. Brothers Auguste and Antonin Daum began experimenting with art glass beginning in the 1890s and continued into the early 20th century. They introduced their cameo glass wares at the Chicago World’s Fair in 1893. Much of the glass made by the Daum Nancy factory was cameo in style. This high quality Daum Nancy miniature cameo art glass vase has a vitreous enamel design feturing apple blossoms. It dates to around 1900. Signed "Daum Nancy" on the base. It measures 2 ½” tall and the condition is excellent. Sold for $1,560 (not including buyer’s premium) in May, 2013. Continue to slide four to see an example of Stevens and Williams cameo glass made in England. William Stevens and Samuel Cox Williams took over their father-in-law’s English glass business in 1847 and subsequently renamed the firm Stevens and Williams. In 1880, Frederick Carder was employed as a designer for the company, and John Northwood became the firm’s artistic director in 1882. John Northwood II took over in 1902 after his father’s death, and Carder left in 1903 to form Steuben Glass Works in the United States. Stevens and Williams was renowned for making art glass including cameo, acid etched, engraved, cut and enameled examples, according to 20thcenturyglass.com. Like other European art glass manufacturers such as Galle’ and Daum operating in France at that time, the various glass crafting techniques they used were often combined to produce unique designs. The firm became suppliers to the Royal Family in 1919, and the name of the business changed to Royal Brierley Crystal in 1931 following a visit from the Duke and Duchess of York. This high quality English four color cameo art glass vase was made by Stevens and Williams, c. 1890s. It has fine hand engraving highlighting a flower and leaf motif on one side (shown). The opposite side is adorned with a beautiful butterfly. The red and white colors stand in striking contrast to the vivid yellow background and white interior making the motif stand out in high relief, according to the Morphy Auctions description. The vase also sits on a small foot and has a geometric decoration around the neck. It measures 4” tall and its condition is excellent. Sold for $1,800 (not including buyer’s premium) in May, 2013. Continue to slide five to see an example of Handel cameo glass made in the United States. 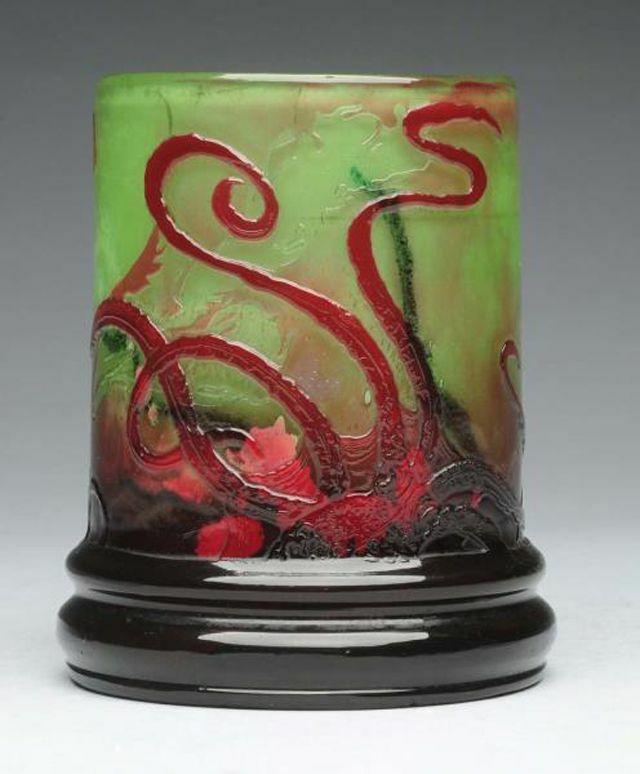 While Handel was best known for making Art Nouveau lamps in the vein of more expensive examples by Tiffany & Co. in the early 1900s, the Connecticut company also produced cameo art glass in limited quantities. The glass pieces, like the company’s lamps, were of high quality and beautifully crafted. This Handel cameo art glass vase (marked Handel No. 4217 on the base) has a wooded scene with trees and birds. It has no damage, and was described as “a magnificent piece” by Morphy Auctions. Measures 11” tall. Sold for $2,160 (not including buyer’s premium) in August, 2014. What Exactly is Carnival Glass?